robertshortt: After the surfboard, use intermediate crimp and edge before next jug with a toe hook on the otherside of the surfboard to keep you on the roof. Cool feature on a pumpy roof route. The best climb I’ve ever done! Such unique features, beautiful climb and definetly not a gimmie! Amazing, flows perfectly. Surfboard feature! Really beautiful feature. Started with my feet out. No flash because I tried and fell on the end of the V5 before doing this one. How amazing is this thing? Climbs so smoothly! Incredible that these features exist for us to climb on. Favorite climb yet! This is how I imagined Hueco. Amazing feature. Lived up to the hype! Can't believe I've never done this before. This is the best V4 on the planet. Perfect polished roof climbing with huecos, jugs, heels, toes, and a surfboard fin that is the coolest hold I have ever seen. The surfboard is for atomic situps. the surfboard feature is super cool! Lives up to the hype like no other. 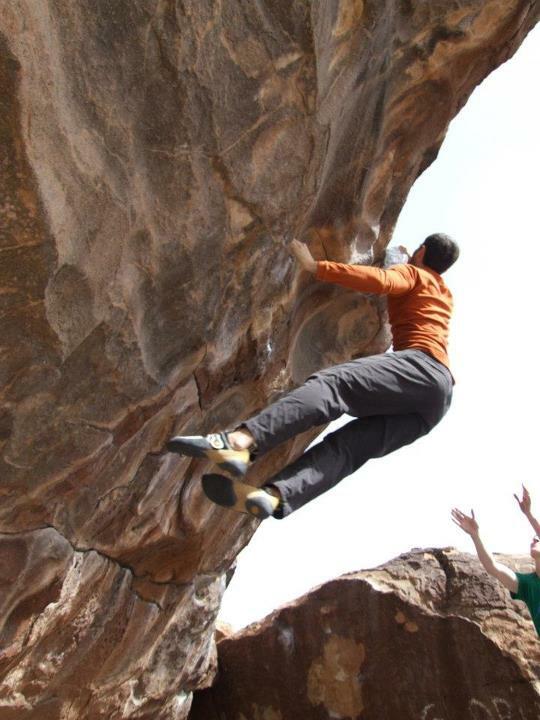 One of the best boulder problems I've ever done. awesome v4! one of the best! Gymnastic roof. So much fun. Would do it 50 more times if I can!